The Chevrolet Beat road test / review you have been waiting for! 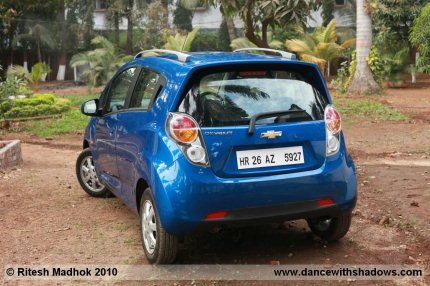 The Chevrolet Beat that finally made it to production, looks as good as the concept car that was showcased earlier in 2007 by General Motors. The design is not really futuristic; but it is very contemporary and aggressive for a small car. Park it anywhere, and the Beat’s bold design shows off its creases and bulges. The car is fun to drive and has a distinct character. Here’s a detailed review and road test of the Chevrolet Beat LT.
From the front, the Beat looks disproportionately larger than the rest of the car, thanks to the massive split Chevy grille, huge headlights, high bonnet and deep chin. From the sides, the Chevy Beat looks very bold with a sharply raised waistline and rear door handles that are uniquely placed where the quarter-glass usually is. Odd, definitely – but it keeps the doors looking clean. The massive, sharply cut wheel arches are nearly as big as some SUVs. They are balanced out by the 14-inch wheels. The tyres could be slightly broader though. 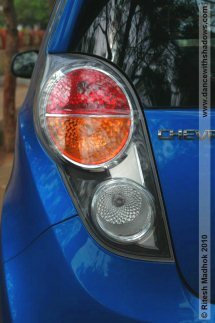 The rear of the Chevrolet Beat is one of the best-looking of any hatch available in India, with retro-looking twin round tail lamps and a two-piece bumper. All in all it’s quite a head turner. The attractive design continues inside the cabin as well, and along with impressive interior quality, makes the Beat quite a special place to be in. The switches and buttons offer a meaty feel, and the nicely textured plastics are among the best we have seen in a small car. 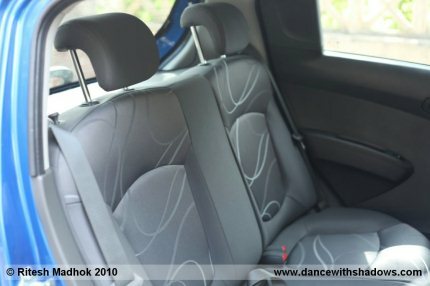 Slip into the driver’s seat and you are hugged by the generous and soft cushioning. Lower back support is terrific, but we missed a seat height adjuster for the driver’s seat. The grey-black interiors although make the car look a little cramped, especially in the rear. The speedometer unit on the Beat is column mounted, with a rectangular digital panel next to it which displays the RPM, fuel level, time and other tell tales. 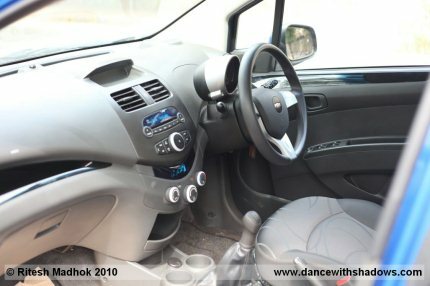 The centre console of the Chevy Beat is very well designed and functional, very nicely lit up at night with a soft blue back light. Integrated CD/MP3 player with AUX and USB does its duty well and the climate control on the top-end version cools the cabin quickly. The 3 spoke steering with silver spokes is appropriately sized and is tilt adjustable. The speedometer console also moves with the tilt-adjustment. The gear knob is a bit oddly-shaped. The dash is a bit high and that’s why we missed the height adjuster on the driver’s seat. Nevertheless a 10/10 for the seats and their support upfront, rear seats are again good offering ample back and thigh support. GM designers have used practically all the cabin corners in the Beat to carve out small cubby holes and pockets to place your mobile, coins etc. 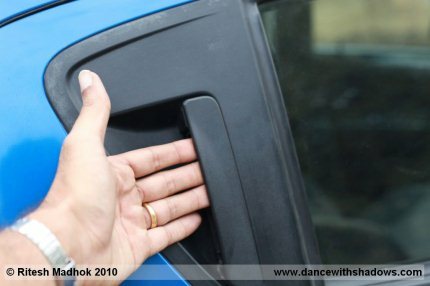 Doors have a nice thud to them when closed and feel heavy. Door pockets are neat, and bottle holders hold a 1 litre mineral water bottle well. The boot holds 170 litres of luggage – a bit of the boot space is sacrificed to increase the legroom. Adjustable headrests offer ample support to the rear passengers, and there is sufficient space for three normal-sized persons – it won’t be very comfortable, but it can be done. The Beat is has a 1200 cc petrol engine under the bonnet. It is very silent at idle. In fact someone may crank the already running engine thinking the engine is off – it is that silent. This S-Tec engine was developed especially for the Beat. It churns out 80 bhp and has 108 Nm of torque. At low revs, the Beat is incredibly refined. Throttle response is perky, which is useful in stop-and-go traffic. It’s not a particularly effortless motor – but if you accelerate a bit and make sure you keep the rpm high, it delivers respectable performance. We reached 100 kph quickly enough, and it can reach 140 kmph given the road. The gear ratios are short, which aids in city driving and also helps during overtaking. Gear changes are smooth, this is one of the best gearboxes in this segment. The ride of the Beat is tuned more for comfort, and the suspension setup absorbs the bumps and potholes very well. The car feels like a bigger car at high speeds and jerks and rattles are absent. Handling is predictable, and the hydraulic power steering is properly weighted. The Beat we road-tested ran on 155/70 R14 tyres. Handling would further improve if broader tyres were used. 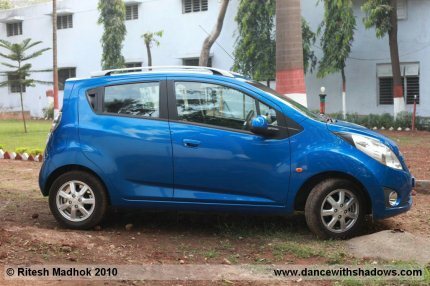 The brakes are good with the right amount of feedback and the Chevrolet Beat LT variant is equipped with ABS, which ensured the car stayed on track even under hard braking. 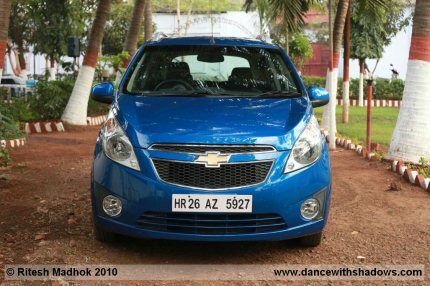 Chevrolet claims a mileage of 18 kmpl for the Beat petrol. During our road test, the Beat returned an overall fuel efficiency figure of 15.5 kmpl – which is very good for a car this heavy. This was in a mix of city and highway driving. The Beat is a stunning-looking hatchback and many of you out there will buy it purely for its styling. It also is very well built and has a nice engine. What’s more irresistible is the pricing which starts at Rs. 3.56 lakh (ex-Delhi) for the base LS and goes up to Rs. 4.26 lakh the top-end LT, while the option pack, which we were driving has safety features such as 2 airbags, alloy wheels and ABS, and costs Rs. 4.73 lakh. The car also comes with GM’s three-year warranty and maintenance package. The Beat in short is one of the most irresistible hatchbacks currently available in its class.